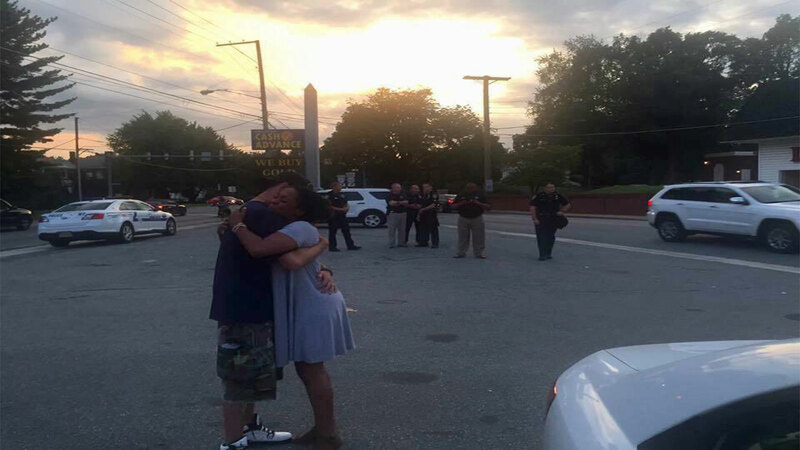 Viral image in Virginia shows unity, "If I were KKK would I hold you like this?" LYNCHBURG,Virginia (WTVD) -- A photo taken at the Jubal Early monument at Fort Early in Virginia has gone viral. Friday evening, rumors of hate groups gathering begun to spread across Lynchburg. After the rumors, the city provided extra security at several locations and had guards on standby. Later that day, one of the guards noticed a Black Lives Matter supporter. The woman was trembling and shaking with fear at the thought of having to face the KKK. The officer approached her with open arms and said: "we are not KKK." The woman hugged on to the guard and wouldn't let go, he explained that they were there to stop and prevent another Charlottesville incident. He said "If I were KKK would I hold you like this and she said "NO". The Virginia Flaggers wrote on their Facebook page that the two talked for a while about solutions for the incidents happening all across the country.